Portrait of 32-year-old Danny Houck who lives in the middle rural Ohio. 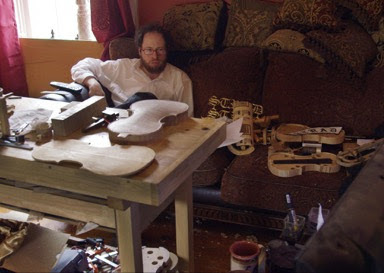 An employed recluse Houck somehow convinces a European concert violinist that he can duplicate a Stradivarius. How you react to this film is going to depend upon how you react to the man at the center of the film. That's a potential issue because he's at the center of the film from start to finish and if he doesn't click with you this can be a long haul. Hauk is clearly a man of great knowledge and skill but he also is an odd duck at times as we see him go through his daily routine. Personally I'm mixed on him. I found what he was doing captivating but I really didn't care much for the man himself. For the most part I really like STRAD STYLE. I think the film is telling one hell of a story, though to be perfectly honest I really don't know why the film is almost two hours long since, as I said Houck is a bit of an acquired taste. That said I want to see the film again because I find the violin stuff fascinating. Definitely worth a look when the film screens again at Slamdance or when the film eventually makes it to a theater near you.